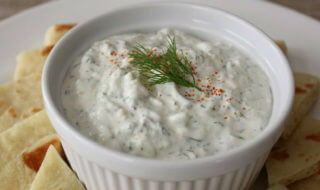 Tzatziki-Yogurt dip recipe is a Mediterranean specialty and is a creamy, smooth textured dip which is made with low fat yogurt and cucumber. This recipe is cool and creamy dip that serves as a perfect accompaniment for grilled meat dishes. It is incredibly easy to make and tastes best when served chilled. Keyword Tzatziki – Yogurt Dip Recipe! Combine peeled and diced cucumber with low fat yogurt, finely chopped garlic, 1 tbsp chopped mint and ground pepper. Mix and serve. Note: The bacteria used to culture yogurt is good for the digestive system. They help to maintain a healthy balance of friendly bacteria in your intestine. Also read about: Exquisite Health Binding Bread Rolls!